Perpendicularly latched stationary base and sliding head/foot piece assure repeatable and accurate measurements. Freestanding-no external supports needed. Locking integral supports stabilize standing base. 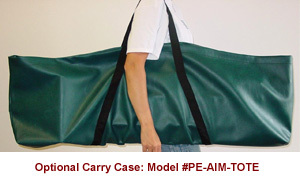 Collapsible design allows for portability. Vinyl carrying case available seperately. Quality wood construction, sealed with the toughest epoxy, and aluminum measuring rod resist staining and warping even in variable climates.